Q: I love your website, and found it very useful. I have a few bills that my family passed on to me recently. I am wondering if you know the value of a 1938 50 rial note. it is of course worn, but i collect them and would like to know if it is worth anything after all these years. A 1938, 50 Rial bank Note - Reza Shah without hat - Green note would be worth $10-$150 depending on condition and more importantly the kind/size/color of stamp on the back of the note. I am trying, without luck, to find the values, in today's market, for Iranian gold coins. Specifically the gold Pahlavi coins. Do you know a web site I can go to? I have some I'd like to sell. Where can I get a value guide. Thanks so much for your help. You can find the value for most Iranian Gold Coin at ebay. 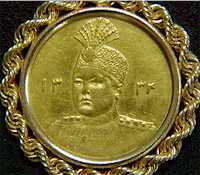 Just go to eBay and type Pahlavi Gold Coin. As of Spring 2007, A 1 Pahlavi goes $175 - $250 depending on the quality and the year it was release. First and last year of Pahlavi coins are more popular. Yes there are several notes with picture of Ayatollah Khomeni. Check the updated "Toman - Iranian Currency Gallery" for many new additions, including 1000, 5000 & 10,000 Rials notes with Ayatollah Khomeni's picture, as well as some rare notes from early days of Shah. As far as the value, the 10,000 Rials note with Ayatollah Khomeni's picture is a current official note worth about $1. The 10,000 Rials note with Shah's picture is a collector's item and can fetch upto $100 depending on condition & Serial #. The coin you have sent is an Ahmad Shah Qajar coin. The date on the front says 1334 (1955) which is confusing since Ahmad Shah was deposed in 1924. See for more info on Ahmad Shah. 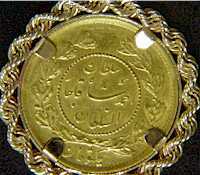 In any case it is a 1 toman (yek toman) coin with the name Ahmad Shah of Iran and date of 1334 (1955) on it. Can you please tell me how much 1000 rials is worth in American dollars??? Mercy for visiting our Website and hope you enjoyed it. 1000 rials is equivalent of 100 To'man. At the current (1998) official rate of 300 To'man = 1 US$, 1000 Rial is worth 33 cents. For a current exchange rate for Iranian Rial VS. US Dollar, Euro, Japan Yen and British Pound visit the Iranian Currency Exchange Table. Q: Hi - Your website says that 100 Dinars equals a rial - is that still true? Are there still dinars used as currency in Iran? Mercy for visiting FarsiNet and "Toman: Persian Coins & Currency" Webpage. Yes, 100 dinars is still equal to 1 rial, BUT the lowest current denomination of currency is 1 rial and the practical lowest denomination is 10 rials which is one Toman. In 60s & 70s the lowest usable denomination was "Da'Shee" which was 50 dinars. I could buy a single pack of chewing gum for "Da'Shee". Last time I visited Iran in 1995, one & five Toman Coins (coins not paper money!!) were the lowest denomination of currency most frequently used. And a very interesting new 250 Rials Coin has just been introduced. I did manage to get a hold of a few of the new 5 Toman (50 Rials) and 25 Toman (250 Rials) coins which I will add to my online collection in near future. Is there a way to find out more information about the coin? There several two ways to find out what is the coin but I have a feeling that its the standard Pahlavi Coin known as 1/4 Pahlavi. An 18 Carat Gold Coin widely used as wedding & special occasion gift. The 1/2 Pahlavi is a bit bigger than nickel and 1 Pahlavi is a bit larger than a Quarter.